This easy Zucchini Bread recipe is amazing, it truly is the BEST recipe! 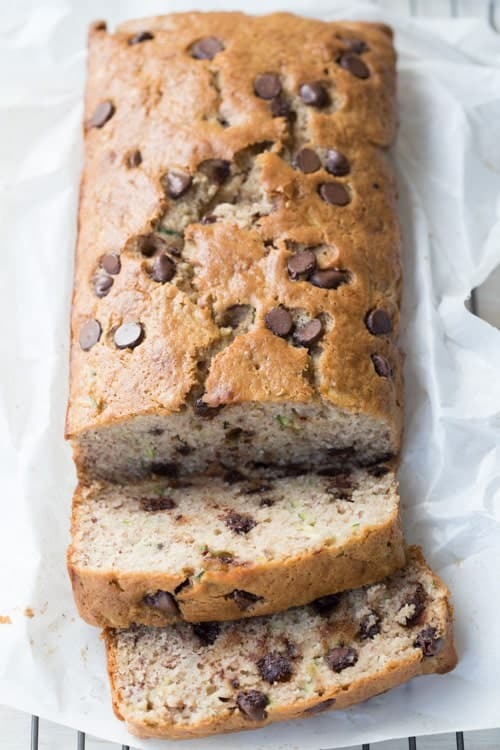 Moist and soft bread loaf loaded with fresh zucchini, bananas and chocolate chips! The bread is not overly sweet but sweet enough to satisfy the dessert cravings! If you like sweet bread, try our Banana Nut Bread or Chocolate Peanut Butter Bread. I love this sweet bread recipe. The amazing flavors of banana, zucchini and chocolate chip morsels is phenomenal. You’d never expect the flavors to work so well together. 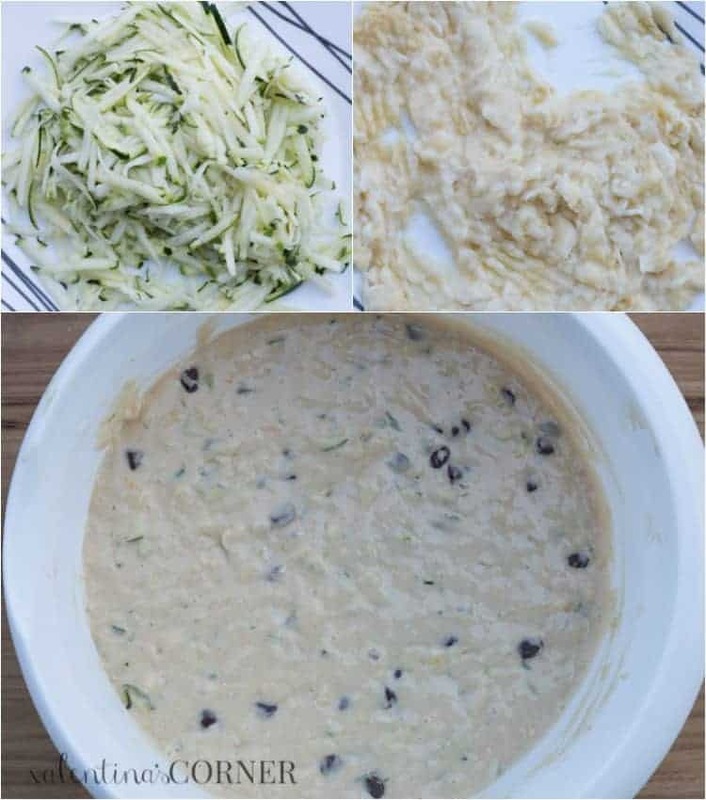 This is a great way to use up overripe bananas or zucchini during zucchini season. This bread is wonderful to gift neighbors, teachers or loved ones around the holidays. In a bowl, combine the flour, cinnamon, baking powder and soda. Grate zucchini. TIP: Don’t squeeze out juices from zucchini, they add moistness to the bread. Add zucchini, bananas, oil, salt and vanilla to egg bowl, mix. Add half of the flour mixture, mix. Add remaining flour and mix until well incorporated. Fold in the chocolate chip morsels, leaving a few morsels. Pour batter into bread pan. Add the few morsels to top of batter. How do you Cut Zucchini for Bread? Do you peel Zucchini? You want to grate the zucchini for zucchini bread. Also, you don’t have to peel the zucchini for bread. Just cup of the ends of the zucchini. How long will Zucchini Bread last? Zucchini bread will stay fresh wrapped for 1-2 days at room temperature, 3-4 days if refrigerated. Keep wrapped. Reheat bread before enjoying if warm bread is desired. Yes, zucchini bread freezes wonderfully. Completely cool bread. Wrap bread in plastic wrap, then foil and freeze, or use a Jumbo Ziploc bag. You can also freeze individually wrapped slices. What size Bread Pan Do I need for Zucchini Bread? This zucchini bread is best if baked in a 9”x5” bread pan. This easy Zucchini Bread recipe is amazing, it truly is the BEST recipe! 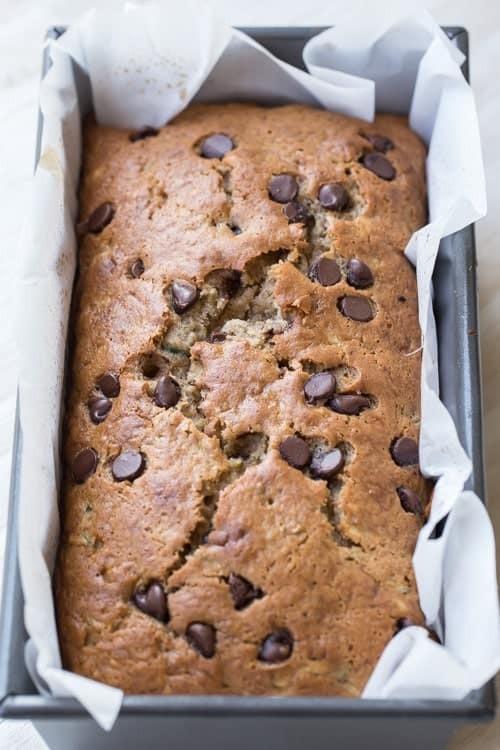 Soft bread loaf loaded with fresh zucchini, bananas and chocolate chips! Preheat oven to 355 °F. In a bowl combine flour, cinnamon, baking soda and baking powder, set aside. With a fork mash the bananas. Grate zucchini. Add bananas, zucchini, oil, salt and vanilla to sugar/egg bowl. Give it a quick mix. Add half of the flour mixture and mix; add remaining flour and mix. Add chocolate chip morsels, mix, leave a few morsels. Pour batter into loaf pan, add the leftover morsels. Bake in preheated oven at 355°F for 40-50 min. Check readiness with a toothpick, it will come out clean if ready. Hello and thank you for the recipe. I have just made it and its in the oven now. It smells great and I guess I will find out in ten minutes. This recipe looks like a great dessert or breakfast. I want it for both. Made this Banana Zucchini Chocolate Chip Bread today. It turned out good. Very simple, fast, & easy to make. Thank you for the recipe @Valentina’sCorner! VJ, Thank you so much for the feedback. ☺ So glad to hear you approved this unique combination ??. .